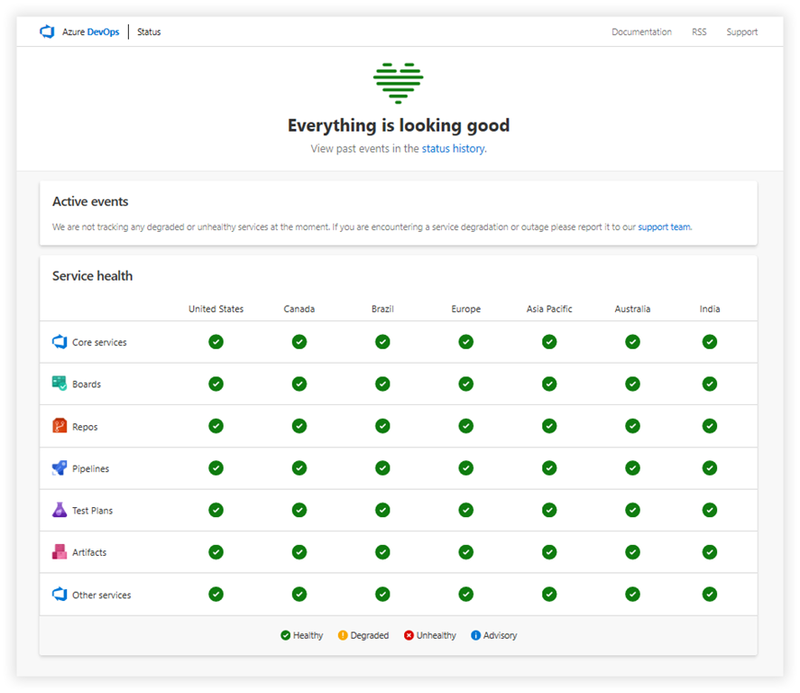 Last week Microsoft introduced the Azure DevOps Service status portal which provides real-time insights into the current health of Azure DevOps regional feature status and provides additional details on specific events either current or historical. When you go to the Azure DevOps Service status portal, the main dashboard shows you a 2-dimensional matrix mapping of the feature with geographic regions as shown below. 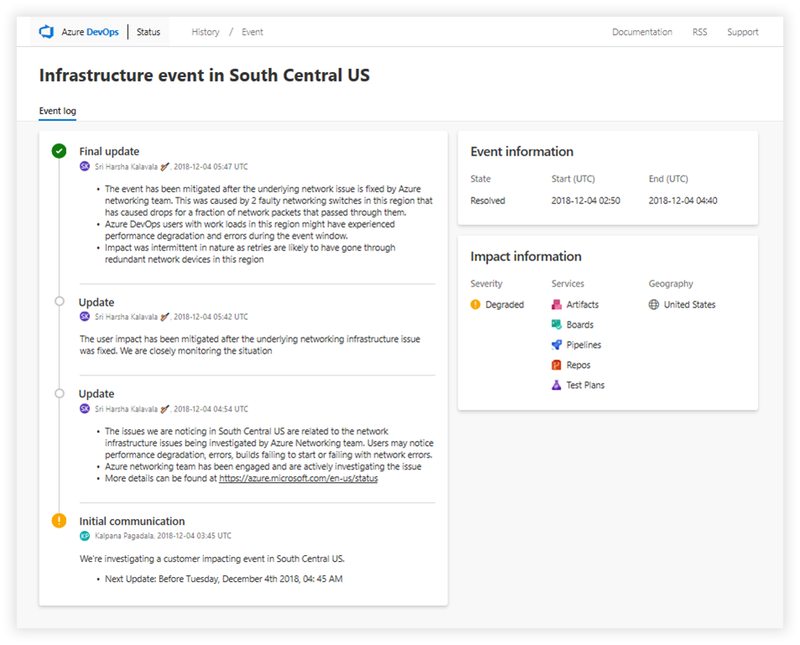 Clicking on a particular event log will take you to the event log page which shows all details about the event, what was affected, when it was resolved, and then any workarounds that users can take if needed. REST APIs will be coming soon for users looking to build automated solutions to watch the service status. 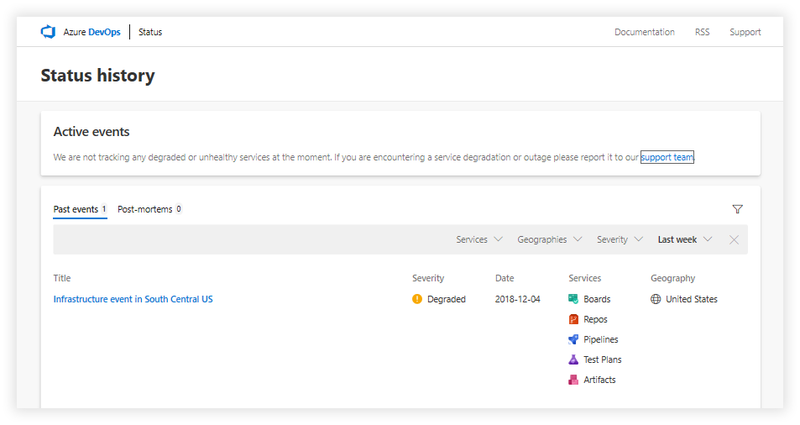 For service health updates relating to Azure’s global services, please refer to the Azure Status page. For more information on the new Azure DevOps Service status portal, please refer to the Azure DevOps Service Status documentation. 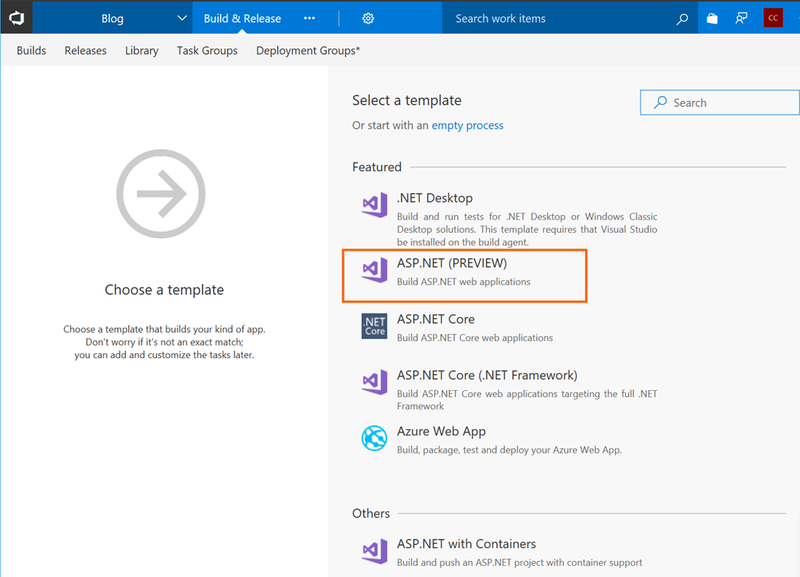 During Azure DevOps build and release pipelines, you might have the need to consult the Azure DevOps REST API. This blog explains how you can easily perform the authentication that is required to call that REST API. This week Azure DevOps finally rolled out one of their most requested feature, a dark theme. 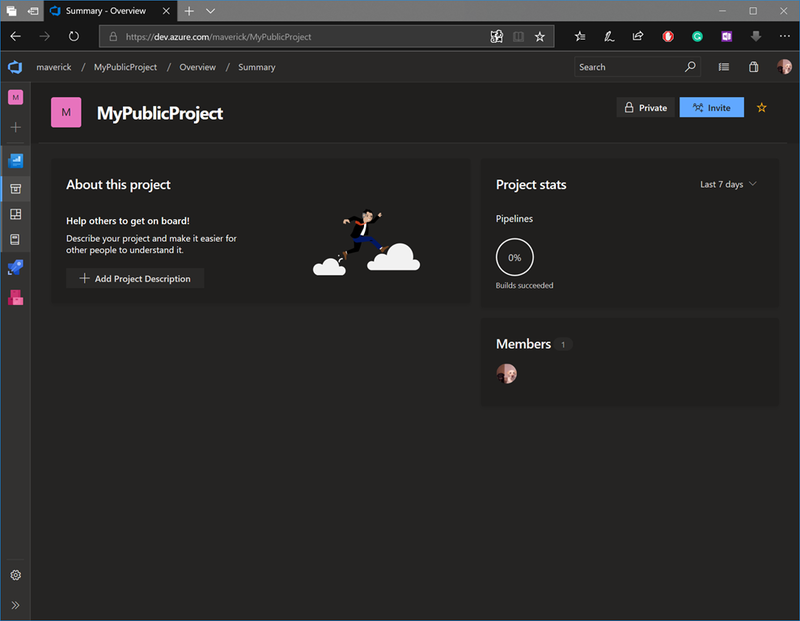 I use dark theme for just about any app that supports it, so this is a welcome addition to Azure DevOps. Keep in mind that this is just a preview and is still being refined. To switch to Dark theme, go to your Azure DevOps portal and click on your user dropdown menu in the top right corner. Then click on Theme menu item. The theme options pane will then be displayed. Click on the Dark (preview) option to switch to the dark theme. Voila! DevOps in Dark theme. Switching to dark theme is a personal choice and is not something that is forced across your organization, which is nice. I recommend you give it a try and see for yourself. DevOps is a culture and practice that unifies people, processes and tools across development and operations groups that aims to help deliver software faster and more reliably. Explore the foundations and four pillars of effective DevOps: Collaboration, affinity, tools, and scaling. Get an overview of DevOps, including the evolution, foundational terminology, and concepts. Understand common misconceptions about DevOps and anti-patterns used in the practice. Download the e-book from here. This book was published on August 31, 2018. So this week Visual Studio Team Services build and release saved me and my team. At our company we have configured an on premise continuous integration server along with build agents using TeamCity which is a product from JetBrains. TeamCity Professional is actually a free application that allows you to run 3 build agents. The only cost is the associated hardware and Windows licensing. I fell in love with TeamCity years ago when I set it up at our company and it’s been a very stable and a versatile CI server since. However this week I ran into some issues with our TeamCity server and the fact that it was on premise only added to the problem. Let me explain. Our build server physical infrastructure is actually located offsite from our office (along with other dev/qa servers), so when I say on premise I really means its dedicated hardware that we own and not up in the cloud. The situation we ran into is that our TeamCity server didn’t restart properly and was unavailable by remote access by the ITOPS team, this meant someone had to go to the offsite location and reboot the server. Now you might be wondering, why don’t you have a backup…a good question and something I’ll be looking into. What made matters worse is that we we’re nearing the end of a regression cycle and we wanted to deploy later this week. So having our build server drop off the grid was just bad timing and it meant DEV and QA were in a holding pattern while we waited for our build server to be brought back up and hopefully it was ok and not corrupted or worse. While we waited for our build server to be restarted I started thinking about worse case scenarios like what if our build server is dead and we need to rebuild or restore from a backup (and what do you know it was out of date). None of these options can be done quickly and they require unplanned resources from the ITOPS team and myself. Having already explored Visual Studio Team Services (VSTS) build and release services for my personal development and that of our Live .NET logging tool ReflectInsight, I knew I could easily and quickly get one of our applications setup in that continuous integration pipeline. You will actually be shocked at how quickly I got things going. 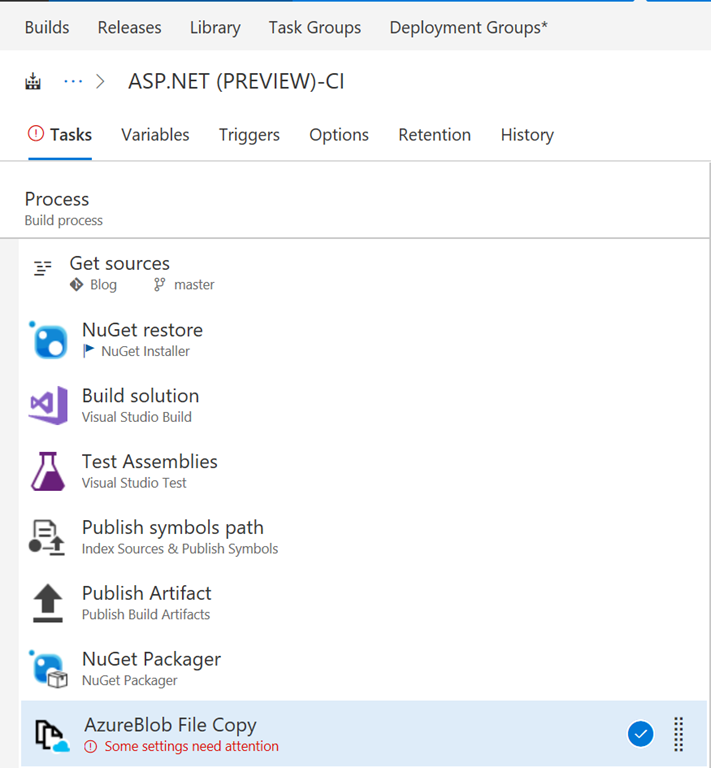 Our current build process typically builds the solution, runs unit tests, creates a nuget package and then finally publishes the nuget package to an internal nuget repository that is part of TeamCity. We then have an automated deployment service called Octopus Deploy that picks up this package and can then deploy to any of our QA and/or production systems. Since our TeamCity server is offline, I would need to publish the nuget package to another destination for the time being. I decided to create an Azure Storage account and then copy the nuget package there. I could then pull the nuget package down and manually upload to our Octopus Deploy server. I wont go into detail for each of these build tasks as their pretty straight forward, but after I had everything setup and tested, I looked at the clock and it was under 15 min from start to finish. That is something I could never have done in our existing on premise build infrastructure and it now looks like I have my backup solution. One of the nice things about using the hosted agent in VSTS is that it’s located in Azure and its a service that is managed by the Azure team. This means I spend more time focusing on developing my applications and less time worrying about managing the associated build infrastructure and what happens if a server goes down, performing backups, restores and that all hands on deck feeling when your infrastructure goes down at the worse possible time.